When I read about Joe Dowell, the saga of Robbie Hart, the character portrayed by Adam Sandler in the Wedding Singer immediately came to mind. Hart confided to the ubercute Julia (Drew Barrymore) that his dream was not necessarily to be a singer but a songwriter and he did successfully court her a mile up in the air with his original rendition of “Grow Old With You”, with the help of Billy Idol, who looked far worse in the 80’s then I remembered. Now this was a romantic comedy so of course, the couple fall in love and are presumed to live happily ever after. Idol told Hart that he was going to tell a record producer about him, so we are left to believe that a coked out Billy Idol remembered this conversation took place, or that he was even on that plane to Vegas, but since there is no Wedding Singer 2, we’ll just assume that happily ever after did occur. 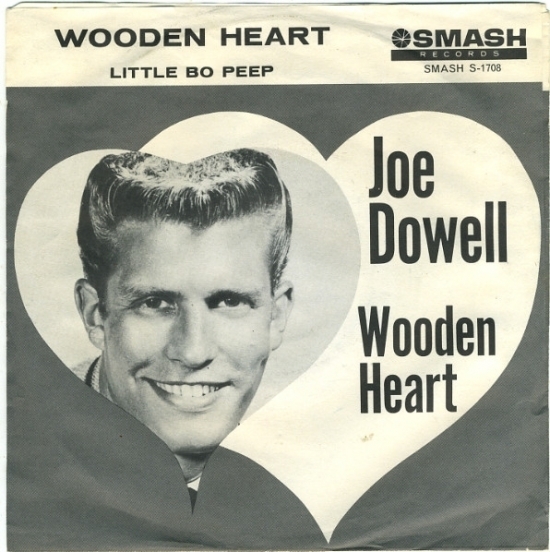 Joe Dowell also had a dream of songwriting, something that securing a number one hit, “Wooden Heart”, should have opened a door for. The song had been earlier recorded by Elvis Presley and was adapted from a German folk song (yes, the Germans again) and would become a big hit in Europe, but likely because Presley recorded the song with some verses in German, it was decided not to release the song in North America, or more curiously, not record an all English adaptation, an opportunity that Dowell’s record label, Smash Records, a Mercury subsidiary capitalized on. This was one of those rare cases where “overnight success” isn’t being misused, as this song was on Dowell’s first recording session and reached the top after only three months of being released. Dowell’s version was soft and tender and worked with his innocent look. It also had a bit of a country flair to it, which gave it added appeal to a different demographic. Dowell was hopeful that this would be able to catapult him to sing his own material, but the label had other ideas, a pattern that exists for many young artists today. He would have a couple of minor hits in 1961 but again with songs he didn’t write. Fighting for creative control would lead to being dropped from the label, but at least he could now make the music he wanted, though there was a problem; nobody bought it and as he was pegged as hard to deal with it, major labels didn’t want to sign him so his work in folk music and later gospel went completely unnoticed. I am not sure if this makes Joe Dowell a pop culture casualty, a pop culture footnote or some combination of both. For a song that went number one, a Google search of “Wooden Heart” does not even bring up his name first, rather it is Presley that takes precedence, which again was for a song never released in the United States, nor one that was even on his regular set list when he toured. Now I wonder if Robbie Hart’s career went better? Other Notable Songs that charted but did not go to number one in this time period: August 28, 1961 – September 3, 1961. 8/29/61: Right or Wrong by Wanda Jackson went to #29 but reached #9 on both the Country and Western chart and the Adult Contemporary Chart. 8/29/61: Don’t Cry No More by Bobby Bland went to #71 and went to #2 on the R&B Chart. Ask some of the people who are signed from American Idol how much creative control they have?